On Thursday 21st January we organised a playtesting session to help out Serious Games designer Tania Vervoelen. Her game, 'Project Ninjas' was a hit and Tania has been kind enough to answer a few questions we all had! Take me through 'Project Ninjas' from idea to game. I started my own learning technologies company a year ago. The first month or so was pretty quiet, trying to build up my clients and market myself. In my free time (which I had plenty of) I wanted to create something fun and exciting that I could use to help my future clients. In my previous full-time employment, I created a board game that was used in L&D workshops. It went down really well, everyone enjoyed it, received great feedback and I really enjoyed making it. 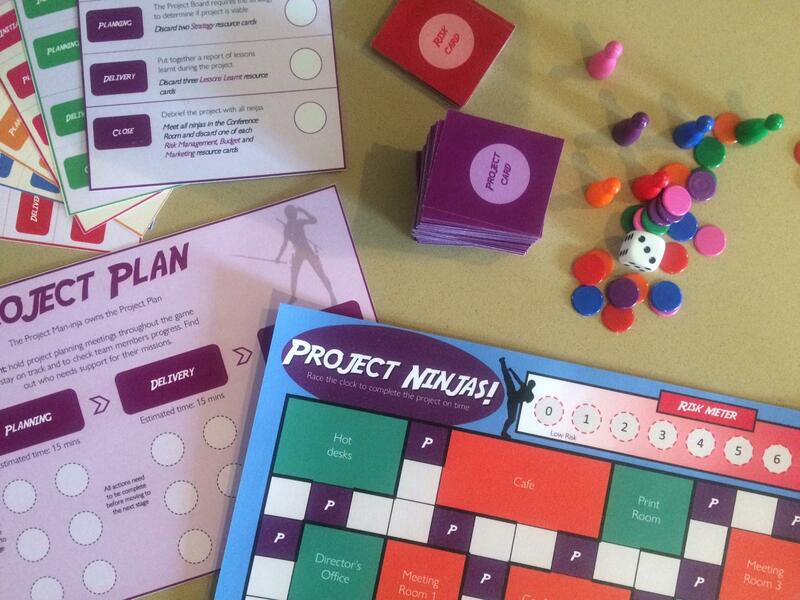 I had the idea to create my own board game and have a subject matter that any client would be able to make use of. That’s where I came up with the idea to do a project management board game. Where/how did you first learn about gamification? I first started building elearning games about six years ago, when a SME (subject matter expert) suggested that we do something a bit different with the online training (elearning). I was all for doing something a bit different that adds a bit of fun. That’s when my enthusiasm for games started, and I wanted to add that element of fun to every learning experience. How did you end up with a board game vs something else on the spectrum, like a simulation? As a learning technologies freelancer, I do so much in the digital space, that it is quite refreshing to do something physical and that gets everyone together in a room. Most things I design tend to be for someone developing their skills individually in front of a computer, so it’s quite exciting to create something where people can collaborate together in a room. What are WE going to learn by playing the game? I’m hoping you will learn something new about the people you are playing with, it’s a team building experience. I designed the game hoping to develop strong teams. At the end of the game, I get the players to discuss how well they collaborated, communicated and if there was any leadership within the team. I also ask what would they do differently if they were to play again? This game can be played in a variety of learning workshops, including project management training, collaboration, leadership and communication skills. What do you think YOU will learn from today's playtest? This will be the fourth time I have play tested Project Ninjas. I’m hoping to refine the mechanics and get it ready for commercial use. The end goal is to sell it to clients with a facilitator pack, so I’m hoping it’s nearly ready for that stage. I’m looking forward to getting everyone’s feedback! What are your top tips for someone interested in doing something like this in the future? Be prepared to play test it many times. You will never get the game mechanics perfect the first few times played, and it will take a few goes and a lot of feedback and observing to get it right. If you’re looking for inspiration to design a new game, try going to a board game café and play heaps with your friends. ​Do you follow the team on Twitter yet?